This article focuses on the achievements and material culture of the Inca, ranging construction techniques and agriculture to quipu and iconic sites such as Machu Picchu. For information about the origins of the Inca people, their religion, and system of government, please see The Inca: Church, State, and the Arc of History in the Realm of the Four Parts. In terms of agriculture, how did the Inca adapt to the requirements of their environment? How did the Inca adapt their environment to meet their requirements? Farming isn’t always the most exciting topic for modern readers, but consider this: an adequate food supply is the number one most basic building block for any society. It is what makes life as you know it possible. So what made life for the Inca possible? Inca civilization was a highly agricultural society, despite the sometimes harsh challenge posed by the climate and geography of the Andes. The genius of the Inca lay in unifying otherwise limited agricultural zones through the power of their strong centralized state. They organized production of a diverse range of crops from the coast, mountains, and jungle regions – a vertical archipelago throughout which they were able to redistribute to the produce of different altitudes and biomes. The result was a wealthy empire the likes of which the Andes had never previously seen. These achievements in agriculture would not have been possible without the centralized government of the Inca. There was a vast workforce within the empire that was at the disposal of the Sapa Inca, and the vast road system allowed the Inca to harvest crops and distribute them throughout their territory. The Inca also constructed ample storehouses, allowing them to live through El Niño years, which brought unpredictable harvests, while some neighboring civilizations suffered. Varieties of potatoes cultivated under different conditions in the Andes, each offering different nutritional properties. It is estimated that the Inca cultivated around seventy crop species. The main crops were potatoes, sweet potatoes, maize, chili peppers, cotton, tomatoes, peanuts, an edible root called oca, and the pseudograins quinoa and amaranth. The crops developed by the Inca and preceding cultures makes South America one of the historic centers of crop diversity (along with the Middle East, India, Mesoamerica, Ethiopia, and the Far East). Many of these crops were widely distributed by the Spanish and are now important crops worldwide. Ideal altitudes for the cultivation of various Andean crops. The Inca cultivated food crops on dry Pacific coastlines, high on the slopes of the Andes, and in the lowland Amazon rainforest. In mountainous Andean environments, they made extensive use of terraced fields which not only allowed them to put to use the mineral-rich mountain soil which other peoples left fallow, but also took advantage of micro-climates conducive to a variety of crops being cultivated throughout the year. Perhaps the most renowned aspect of Inca architecture is the use of terraces to increase the land available for farming. These broad steps provided flat ground surface for food production while protecting city centers against erosion and landslides common in the Andes. The masons at Machu Picchu built these so well that they were still intact in 1912 when Hiram Bingham re-discovered the site. In the South American Andes, farmers have used terraces, known as andenes, for over a thousand years to farm potatoes, maize, and other native crops. The terraces were built to make the most efficient use of shallow soil and to enable irrigation of crops. They provided the food necessary to support the populations of great Inca cities, temples, and grand palace complexes, such as Machu Picchu. Until 1492, the Americas were isolated from Europe, Asia, and Africa. This meant that ancient Andeans had only indigenous species of animals and plants available to them for domestication. Since the Americas lacked large animals suitable for domestication – such as horses, oxen, or cows, which all evolved in the Old World – people needed to invent agricultural tools such as the Chaki taklla, a human-powered foot plough that consists of a wooden pole with a curved sharp point, often made of stone or metal. Across the end of this pole ran another wooden crossbar, on which the farmer could put his foot to sink it into the earth and produce a furrow for planting potatoes. 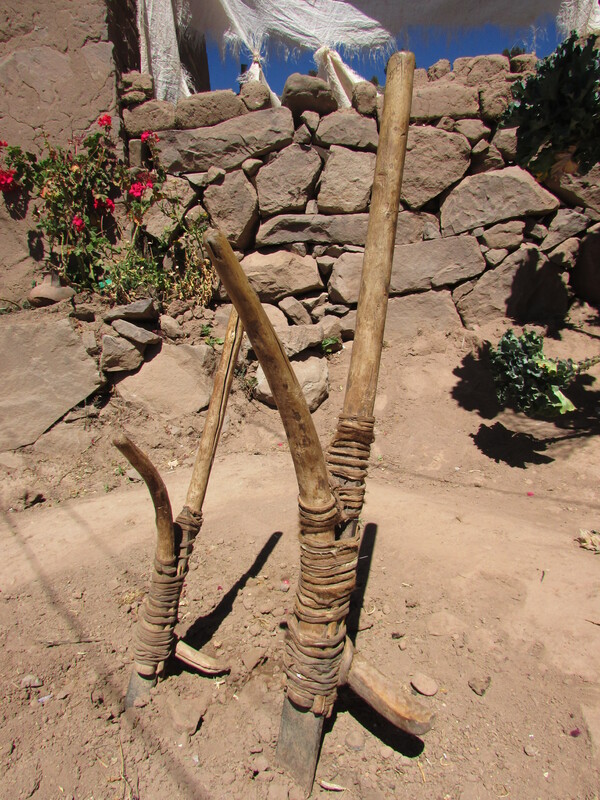 This tool is still used in some parts of the Andes. In the Inca empire, llamas were the only beasts of burden, and many of the people dominated by the Inca had long traditions of llama herding. For the Inca nobility, the llama was significant symbol of prosperity, and llama figures were often buried with the dead. Alpacas were the close cousins of llamas, raised for their wool and meat. The guinea pig was first domesticated as early as 5000 BC for food by tribes in the Andean region of South America, some thousands of years after the domestication of the South American camelids. Statues dating from circa 500 BC to 500 AD that depict guinea pigs have been unearthed in archaeological digs in Peru and Ecuador. The Moche people of ancient Peru worshipped animals and often depicted the guinea pig in their art. From about 1200 AD to the Spanish conquest in 1532, selective breeding resulted in many varieties of domestic guinea pigs, which form the basis for some of the modern domestic breeds. They continue to be a food source in the region; many households in the Andean highlands raise the animal, which subsists on the family’s vegetable scraps. What are quipu? What kind of applications would this system have? What limitations? Could one use it effectively for multiplication? To design a large building? Pass a story from one generation to the next? The Inca had no written system of communication. However, they did have one of the most unusual systems of record keeping in all world history – the quipu. A quipu usually consisted of colored, spun, and plied cords made from alpaca fiber. These strings were tied into knots, representing digits similar to modern tally system. A quipu could have only a few or up to 2,000 cords. Quipucamayocs, the accountants of the Inca Empire, created and deciphered quipu knots. Quipucamayocs could carry out basic arithmetic operations, such as addition, subtraction, multiplication, and division. Using Quipu, they kept track of mit’a, a form of taxation. The quipucamayocs also tracked the type of labor being performed, maintained a record of economic output, and ran a census that counted everyone from infants to “old blind men over 80.” According to Inca chronicler Felipe Huaman Poma de Ayala, quipucamayocs could “read” the quipus with their eyes closed. Inca historians used quipus when telling the Spanish about Tawantinsuyu history. Quipu literacy was probably not widespread, however – members of the ruling class and those who would join the empire’s bureaucracy were usually taught to read quipus in the Inca equivalent of a university, the yacha-huasi (literally, “house of teaching”), in the third year of schooling. Unfortunately, today, most knowledge of how to read quipu has been lost, as the Spanish never bother to preserve it – and in some cases actively repressed it. In Quipu, each cluster of knots is a digit. Some data items are not numbers but what are called number labels. They are still composed of digits, but the resulting number seems to be used as a code, much as we use numbers to identify individuals in the form of social security numbers, places through ZIP codes, or items such as bar codes in a store. Lacking the context for individual quipus, it is difficult in the modern day to guess what any given code might mean. Other aspects of a quipu could have communicated information as well: color-coding, relative placement of cords, spacing, and the structure of cords and sub-cords. Why was an advanced road system so important to the administration of the Inca Empire? What skills were required of a chasqui? The Inca road system was the most extensive and advanced transportation system in pre-Columbian South America. It was about 39,900 kilometres (24,800 mi) long, nearly enough to reach around the entire Earth, if laid end-to-end! Smithsonian Magazine has described the Inca road network as, “arguably the biggest, most complex construction project ever undertaken.” The Incas developed techniques to overcome the difficult territory of the Andes. On steep slopes they built stone steps resembling giant flights of stairs. In desert areas near the coast they built low walls to keep the sand from drifting over the road. The Qhapaq Ñan (“the beautiful road”) constituted the principal north-south highway of the Inca Empire traveling 6,000 kilometers (3,700 mi) along the spine of the Andes. The Qhapaq Ñan unified this immense and heterogeneous land through a well-organized political system of power. To span the steep valleys of the Andes, the Inca used natural fibers found within the local vegetation to build bridges. These fibers were woven together creating a strong enough rope and were reinforced with wood creating a cable floor. Each side was then attached to a pair of stone anchors on each side of the canyon with massive cables of woven grass linking these two pylons together. Adding to this construction, two additional cables acted as guardrails. The cables which supported the foot-path were reinforced with plaited branches. This multi-structure system made these bridges strong enough to even carry the Spaniards while riding horses after they arrived. The design naturally sags in the middle. Part of the bridge’s strength and reliability came from the fact that each cable was replaced every year by local villagers as part of their mit’a public service or obligation. In some instances, these local peasants had the sole task of maintaining and repairing these bridges so that the Inca highways or road systems could continue to function. Chasquis were agile and highly-trained, physically fit messengers that were in charge of carrying quipus, messages, and gifts throughout the Inca empire along its vast system of roads. A message could travel up to 100 miles per day through the chasquis relay system. Chasquis were not just messengers (those were young boys who were just used to pass along basic information), the chasquis were trained to be able to read and translate quipus to each other and higher authorities. Chasqui playing a pututu and carrying a quipu. Each chasqui carried two items, a quipu and a pututu. Chasquis were educated, able to read, translate, and transfer the information on quipus. A quipu was useless without the chasqui who delivered it – since the quipu held primarily numeric information and was not a true alphabet, he carried the oral message that provided context for the information encoded in the quipu. The pututu was a conch shell used as a trumpet, meant to signal to other chasquis that one runner was approaching the tambo – the next chasqui should prepare to run. Tambos, or relay stations, were used for the chasquis to stop and transfer messages to the next chasqui. Found along Incan roads, tambos typically contained supplies, served as lodging for itinerant state personnel, and were depositories of quipu-based accounting records. Individuals from nearby communities within the Inca empire were conscripted to serve in the tambos, as part of the mit’a labor system. Chasquis would start at one tambo and run to the next tambo where a rested chasqui was waiting to carry the message to the next tambo. The Incas built many tambos when they began to upgrade the road system during the reign of Thupa Inka Yupanki from 1471 to 1493. Scholars estimate that there were 2,000 or more tambos. Given this amount, the sheer variety of tambo size and function are hard to fully describe. At a minimum, tambos would contain housing, cooking facilities, and storage facilities. The smallest tambos served as relay stations for the chasquis. Larger tambos could provide other functions as well. For example, larger tambos would have larger storehouses that could provide supplies and some lodging for armies on the move. The largest and most luxurious tambos were generally used to lodge the traveling Inca and his entourage (typically wives and state officials). A typical Inca doorway still used in the town, 2016. Note the single stone lintel above the doorway, a sign of importance – a person of high rank would have slept here. Qullqa (imperial storehouse) above Ollantaytambo, Peru, 2016. This high position would have allowed for good natural ventilation, prolonging the life of the goods stored inside. Ollantaytambo is a large-scale tambo created by the Inca emperor Pachacuti. The town provided lodging for the Inca nobility. Describe the techniques used by the Inca to construct buildings that remain standing more than five hundred years after their original construction. Compare those techniques to those used to construct your school and your home – will these more modern structures last as long? Why or why not? Why did the Spanish destroy or build churches on top of many Inca sacred structures? In what ways might this be considered not just to the Inca and their descendants, but to all of humanity as well? The Inca built their cities with locally available materials, usually including limestone or granite. To cut these hard rocks the Inca used stone, bronze or copper tools, usually splitting the stones along the natural fracture lines. Without the wheel the stones were rolled up wood beams on earth ramps. Extraordinary manpower would have been necessary. The ‘secret’ to the production of fine Inca masonry was the social organization necessary to maintain the great numbers of people creating such energy-consuming monuments – without the authority of the Sapa Inca to command labor from his people, such extraordinary construction could never have been completed. The Andes are a seismically active region, prone to many earthquakes. While the Inca would not have understood the scientific reasons why earthquakes occurred, they developed many techniques to build structures that could resist damage from these earthquakes. Many Inca structures stand today just as they did when they were constructed five hundred years ago – surviving dozens or hundreds of quakes in between. Inca walls have many stabilizing features: doors and windows are trapezoidal, narrowing from bottom to top; corners usually are rounded; inside corners often incline slightly into the rooms; and outside corners were often tied together by “L”-shaped blocks; walls are offset slightly from row to row rather than rising straight from bottom to top. During an earthquake with a small or moderate magnitude, masonry was stable, and during a strong earthquake stone blocks were “ dancing ” near their normal positions and lay down exactly in right order after an earthquake. The most common structure in Inca architecture was the rectangular building without any internal walls, roofed with wooden beams and thatch. The most famous Inca structure of all is probably Machu Picchu. Machu Picchu is a 15th-century Inca citadel situated on a mountain ridge 2,430 metres (7,970 ft) above sea level. It is located in the Cusco Region, Urubamba Province, Machupicchu District in Peru, above the Sacred Valley, which is 80 kilometers (50 mi) northwest of Cusco and through which the Urubamba River flows. Most archaeologists believe that Machu Picchu was built as an estate for the Inca emperor Pachacuti (1438–1472). The Incas built the estate around 1450 but abandoned it a century later at the time of the Spanish Conquest. Although known locally, it was not known to the Spanish during the colonial period and remained unknown to the outside world until American historian Hiram Bingham brought it to international attention in 1911. One notable feature of Machu Picchu is the Inti Watana. Inti Watana is a notable ritual stone – a sundial – associated with the astronomic clock or calendar of the Inca in South America resembling many once found throughout the empire. It was aligned with the sun’s position during the winter solstice, which takes place in the southern hemisphere on June 21. In the late 16th century, the Viceroy Francisco de Toledo and the clergy destroyed those inti watana which they could find. They did so as they believed that the Incas’ religion was a blasphemy. The inti watana of Machu Picchu was found intact by Bingham in 1911, indicating that the Spanish conquerors never not found it. Qurikancha (Quechua: quri gold, kancha enclosure, enclosed place, yard, a frame, or wall that encloses,) originally named Inti Kancha (Quechua inti sun) or Inti Wasi (Quechua for “sun house”), was the most important temple in the Inca Empire, dedicated primarily to Inti, the Sun God. It was one of the most revered temples of the capital city of Cusco. After overseeing the expansion of the Inca Empire, a triumphant Pachacuti rebuilt Qurikancha, enriching it with more oracles and edifices. He provided vases of gold and silver for the Mama-cunas – the nuns who tended the temple – to use in the veneration services. Finally, he took the bodies of the seven deceased Incas, and enriched them with masks, head-dresses, medals, bracelets, scepters of gold, placing them on a golden bench. The walls were once covered in sheets of solid gold, and its adjacent courtyard was filled with golden statues. Spanish reports tell of its opulence that was “fabulous beyond belief”. When the Spanish required the Inca to raise a ransom in gold for the life of the leader Atahualpa, most of the gold was collected from Qurikancha. The Spanish conquerors built the Church of Santo Domingo on the site, demolishing the temple and using its foundations for the cathedral. Construction took most of a century. This is one of numerous sites where the Spanish incorporated Inca stonework into the structure of a colonial building. Major earthquakes severely damaged the church, but the Inca stone walls, built out of huge, tightly-interlocking blocks of stone, still stand due to their sophisticated stone masonry. Andean culture is one of the world’s most ancient, but it may not immediately be apparent how it has impacted your life. Consider one small aspect: the potato, the Inca’s staple crop, domesticated in the Andes about eight thousand years ago. Research and report on the question: How has the potato changed world history? Andes culture developed many novel techniques to overcome the challenges presented by their natural environment, from the steep mountainsides around them to the lack of plow animals native to South America. Try your hand at building a working Chaki taklla. Document the process and use it to plant a garden in your backyard or schoolyard. Felipe Huaman Poma de Ayala (ca. 1535 – after 1616) was a Quechua nobleman who produced the book, El primer nueva corónica [sic] y buen gobierno (The First New Chronicle and Good Government), a 1,189-page documentary of life in Peru under the Spanish. Written between 1600 and 1615 and addressed to King Philip III of Spain, the Corónica outlines the injustices of colonial rule and argues that the Spanish were foreign settlers in Peru. “It is our country,” he said, “because God has given it to us.” The king never received the document, and it sat in storage, lost and ignored until the 1900s, when it became a valuable resource for historians interested in the Inca. It features 398 full-page drawings depicting the history and culture of the Inca. Browse the document and choose one illustration to research in greater depth, presenting a report on the event or cultural practice depicted. Make a quipu recording the biographical facts of your family – birthdays, ages, and any other information you can encode. As you work, consider, what are the benefits and drawbacks to this system of record keeping? Take a guided visual tour through modern day Peru with this curated photo essay. The Conquest of the Incas by John Hemming. This lesson was made possible through a generous grant from Fund for Teachers.